"Internet Yami-Ichi" can be translated as "The Internet Black Market—" but since the word "yami" can also mean "sick for" or "addicted to," it could also be translated as "Internet Obsessive Market." Attention, nerds and net art aficionados: Internet Yami-Ichi, the spectacularly weird free pop up market that is an IRL embodiment of the broad spectrum of web culture, returns to New York for its second iteration on Sunday, November 6th. Last year's Yami-Ichi included a wide range of bizarre offerings, including a WebMD booth with a performer in the role of WebMD, a service for sending snail mail spam, scratch-off tickets awarding social media followers, Skype calls with an artist's parents and lots and lots of offerings on the tumblrcore and glitch art spectrums. The Yami-Ichi was founded by a IDPW, "a loose collective of approximately 10 Japanese media artists" who also organized Internet Bedroom, a "sleepover party on the Internet." The Yami-Ichi first took place in Tokyo and has traveled to Berlin, Moscow, and Seoul, among other cities around the world. Applications for tables at the Yami-Ichi will be open through October 20th, and application guidelines are available here. RSVP on Facebook here, and enjoy the web culture! 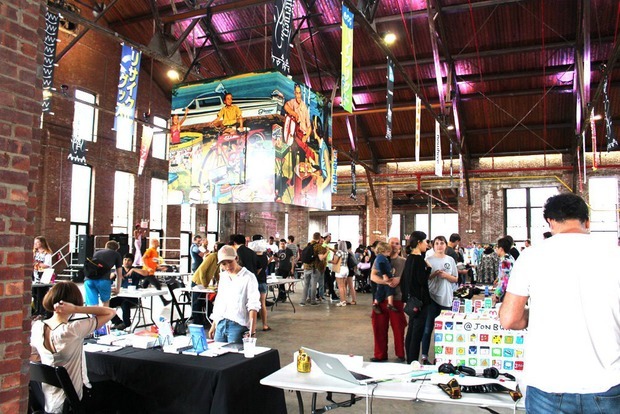 Featured image: Last year's Internet Yami-Ichi at Knockdown Center. Michelle Christina Larsen for Bushwick Daily.